Army Pfc. Bradley Manning is the main suspect in the leak of secret military documents, a Pentagon official says. 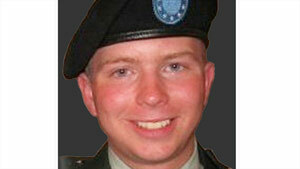 Washington (CNN) -- The Pentagon is focusing on jailed Army Pfc. Bradley Manning as the main suspect in the leak of tens of thousands of secret U.S. military documents related to the war in Afghanistan, a senior Pentagon official told CNN Wednesday. The FBI is assisting in the Defense Department investigation as well, FBI Director Robert Mueller said Wednesday. "We're currently supporting the DOD investigation into that leak, and to the extent that DOD needs our assistance or we can be of help we are providing that support at this juncture," Mueller told the Senate Judiciary Committee. "I can't say as to where that particular investigation will lead." The Pentagon official said investigators now believe Manning logged into a system called the Secret Internet Protocol Router Network, which essentially provides military members who have appropriate security clearances access to classified e-mails and the military's classified Internet system. But the official emphasized passwords and other control measures such as physical access are needed to log onto specific systems that provide information classified at the highest levels. Pentagon officials have said for the past several days that so far the only material they have seen on the website WikiLeaks.org is classified at the "secret" level, a relatively low-level designation that allows for a large number of military personnel to access the information. The senior Pentagon official told CNN that for now, Defense Secretary Robert Gates is relying on the Army criminal investigation into Manning and the leaks to determine how it happened and what might need to be done to prevent future cases. "The secretary is determined to get to the bottom of this," the official said. The editor in chief of WikiLeaks, Julian Assange, has refused to say where his whistle-blower website got about 91,000 United States documents about the war. Some 76,000 of them were posted on the site Sunday in what has been called the biggest leak since the Pentagon Papers about the Vietnam War. The Pentagon has said it has not seen any top-secret information in any of the papers, and both the Defense Department and the White House say they don't contain much new information about the war, now nearly nine years old. Maj. Gen. John Campbell, the U.S. commander in eastern Afghanistan, told reporters Wednesday that he doesn't believe the release has had "a great impact currently on us." "We have not changed any of our operations or any strategy here based on that leak," he said. Manning was charged in June with eight violations of the U.S. Criminal Code for allegedly illegally transferring classified data, reportedly including an earlier video that wound up on WikiLeaks.org. The private had top-secret clearance as an intelligence analyst for the Army when he was stationed in Iraq. The Army is considering whether Manning should face the military equivalent of a trial over the charges. He has not yet entered a plea, since there has not yet been a decision about whether he should face trial, Army Maj. Bryan Woods told CNN. Military lawyers for Manning referred CNN questions about him to Woods. Meanwhile, anti-war activists have rallied around the jailed soldier. A group called "Courage to Resist," which supports troops who refuse to take part in the war, has begun soliciting funds for Manning's defense online. Jeff Paterson, the group's director, told CNN he has been in touch with Manning's family and has raised about $4,000 for his defense so far. "If Bradley is behind the larger WikiLeaks documents, he seems to be the kind of guy who didn't do this for any other reason that he had a guilty conscience," he said. "He just couldn't keep to himself the things that he knew which he felt were morally objectionable." Manning is being held at a U.S. base in Kuwait since his arrest in June in connection with the release of classified U.S. military combat video, which showed the shooting deaths of Iraqi civilians and two journalists in 2007 by a helicopter gunship. He has invoked the Fifth Amendment and is refusing to answer questions, the Pentagon official said. Among the other counts he faces, Manning has been charged with communicating, transmitting and delivering national defense information to an unauthorized source and disclosing classified information concerning the national defense with reason to believe that the information could cause injury to the United States. The latter charge stems from the leak of the helicopter video. The documents released by WikiLeaks are divided into more than 100 categories and touch on everything from the hunt for al Qaeda leader Osama Bin Laden to Afghan civilian deaths resulting from U.S. military actions. Tens of thousands of pages of reports document attacks on U.S. troops and their responses, relations between Americans in the field and their Afghan allies, intramural squabbles among Afghan civilians and security forces, and concerns about neighboring Pakistan's ties to the Taliban. CNN has not independently confirmed the authenticity of the documents, but neither the White House nor the Pentagon has denied that they are what WikiLeaks claims they are. And WikiLeaks has another 15,000 documents that it plans to publish after editing out names to protect people, according to Assange. Assange said his website is not campaigning against the war. "WikiLeaks does not have an opinion whether the war in Afghanistan should continue or not continue. ... It should continue in a just way if it's to continue at all," he said. CNN's Barbara Starr, Mike Mount, Ashley Fantz and Richard Allen Greene contributed to this report.